Connoisseurs of great piano playing will love these classic reissues. 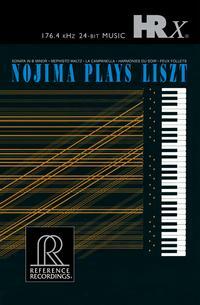 Nojima Plays Liszt was named “Best Recording of the Month” by Stereo Review when it was released in 1988. It was described as “A stunning demonstration of technique put at the service of profoundly musical ends.” Minoru Nojima, is one of Japan’s most internationally respected pianists. Albert Goldberg of the Los Angeles Times said, “The pianistic hurdles leaped with incredible fleetness and lightness, punctuated by volcanic outbursts of power and majesty. It was the sort of impossible thing rendered possible only by genius. Repeat: genius."